My favourite standby dishes come and go quite quickly. I guess this is due to mainly what is in season, in the fridge and how bothered I am to make an effort. Fatigue can set in early once I arrive home from work and find a glass of wine in my hand. This is recipe is easy, trust me. I try to think of ways to add pickled red onion to everything at the moment. I pretty much love pickled anything, full stop. I can’t stand harsh raw onion in salads especially the continued after taste. Once you lightly pickle them they become softer, sweeter and brighter. It’s my substitute for a dressing, it’s like my winter vinaigrette. You could easily make substitutions for the other ingredients. Sweet potato instead of pumpkin, pearl barley would work well instead of the red rice and of course there are many substitutes for the cavolo nero. Mix it up with strong winter greens, like kale, or swiss chard. The haloumi is kind of a must for me although a persian feta could also do the trick I guess. 3 wedges of pumpkin ( not a dry pumpkin, I like jap or butternut) leave the skin on, you can eat it. Set oven to 175°C. Stand the pumpkin up in a shallow tray, drizzle with olive oil, salt and pepper and place in the oven for 45 minutes. The cooking time will depend on how thick you cut the wedges. Combine the red wine vinegar, sugar and salt in a small saucepan. Warm on a low heat until sugar is dissolved. Remove from heat and add onion. Leave to cool. You will only need a small amount of this. 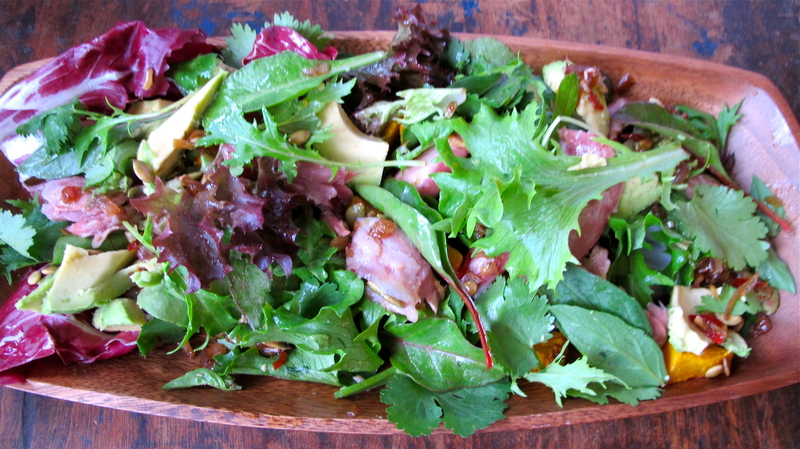 Keep remainder in the fridge for a week to use on other salads. Place the rice in a small saucepan just covered with cold water (about an inch above usually suffices). Bring to the boil and reduce to a low simmer, covered for 12-15 minutes. Drain and keep warm. 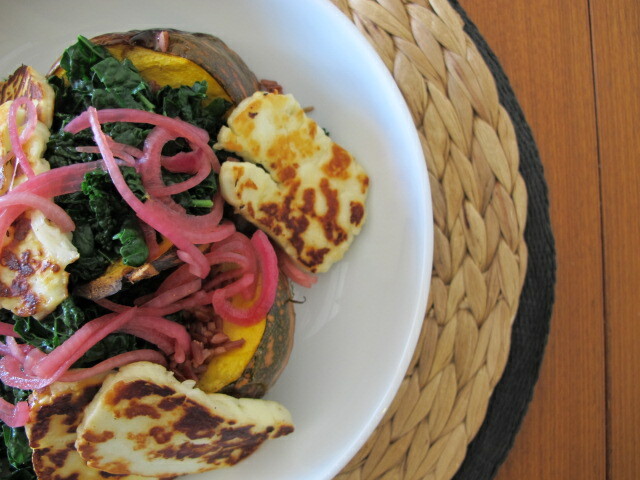 When the pumpkin is nearly ready, grill the haloumi in a dry pan on med-high heat until golden brown. When you have turned the haloumi over add the cavolo nero to the other half of the pan to wilt. Remove pumpkin from the oven and place in serving dish. 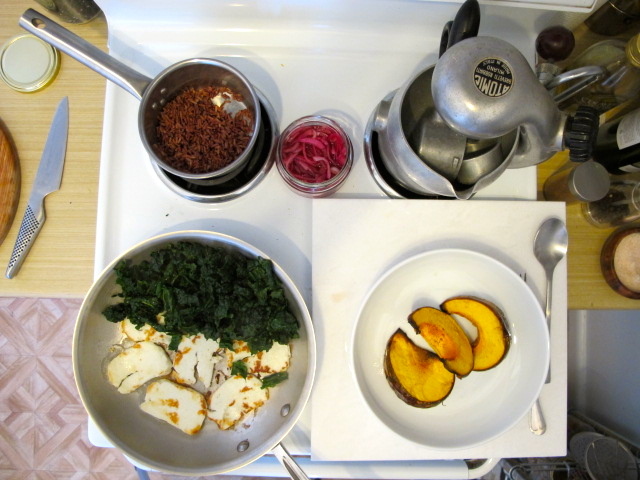 Spoon over red rice, then the cavolo nero, a small amount of the pickled onion and the haloumi. I bought the new cookbook by Alice Hart, sight unseen. The cover was my only glimpse into this fabulous book. Although that’s not totally true, I’ve cooked from Alice’s books before and I knew it would be great, I new I needed to have it (words from a cookbook addict for sure). And I was right. The book is a beautiful and Alice should be very pleased with this one. 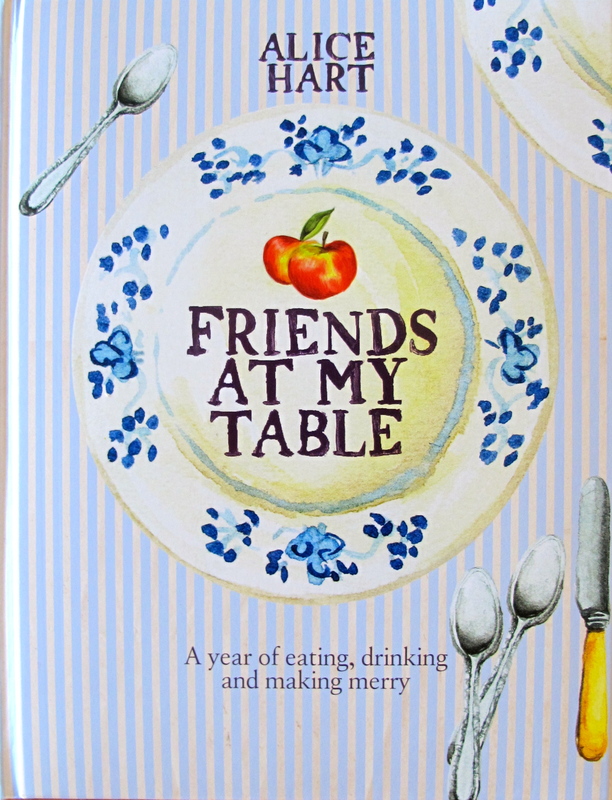 Friends At My Table is a collection of recipes you can use individually or as a menu to share with friends. From Vietnamese inspired bridal showers, to Autumn picnics, glamping, and a beach cricket barbeque menu. There is alot of the outdoors in Alice’s books which reflects her love of traveling in her beloved campervan, Myrtle the Hurtle. It’s inspiring. 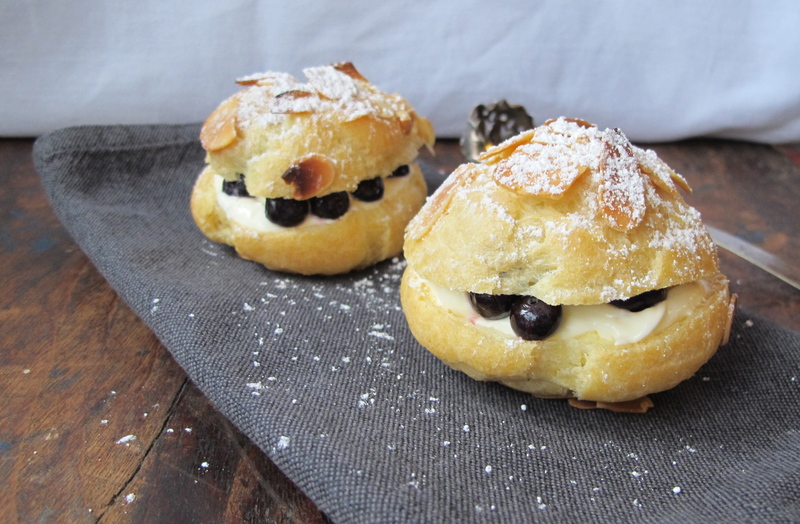 I was going to share the recipe for these delicious little blueberry, almond and vanilla choux buns with you but then I made the crisp ham and pumpkin salad. Alice describes the recipe as her favourite in the book, and I know why. OK so the picture doesn’t do it justice. There are a few components to the dish before assembly but it’s simple and you will want to make it again and again. I reduced the serving size by a third to make two perfect portions. The recipe is not exactly the same as printed but pretty much. It is shared with you by the kind permission of Quadrille Publishing. Crisp Ham Hock and Pumpkin Salad, chilli dressing and toasted pumpkin seeds. Preheat oven to 140°C fan. Put the hock into a small roasting tin, cover with foil and roast for 2 or so hours until the meat is falling off the bone. Let it cool enough to remove the skin and excess fat. Break into small pieces. This maybe done up to two days in advance. Return meat to room temperature cover with foil and heat in a low oven. For the pumpkin heat the oven to 220°C fan. Toss the pumpkin in oil, season and roast in a lined baking tin for 30 mins or until tender and edges golden. This can also be done two days ahead and reheated in the same way as the hock. Toast the pumpkin seeds in a dry frying pan, shaking them about until golden and fragrant. Set aside to cool. To prepare the lime leaves, stack them on top of each other, cut out the stalk, roll tightly and slice as thinly as possible. Place 2 tablespoons of olive oil in a moderate frying pan, add shallots and cook gently for 10 minutes but not to colour. Add sugar and cook for two minutes. Then add the chilli, ginger, garlic, lemongrass and lime leaves. Keep the heat very low and cook for 5 minutes. Remove from the heat and let cool slightly before adding soy sauce, lime juice (and lime zest if using instead of lime leaves), remaining olive oil and sesame oil. Combine salad leaves and herbs, scatter the pumpkin, pumpkin seeds, avocado and ham pieces over it, followed by the dressing and cracked black pepper to taste.